It could become one of the most important legal battles in music - Sir Paul McCartney is suing Sony over control of The Beatles' back catalogue. The star has gone to a US court, seeking to regain the publishing rights to 267 of the band's classic songs. He's been trying to get them back since the 1980s, when Michael Jackson famously out-bid him for the rights. Jackson's debt-ridden estate sold the songs to Sony last year, along with others including New York, New York. Sir Paul's legal case, filed in a Manhattan court on Wednesday, is over what is known as copyright termination - the right of authors to reclaim ownership of their works from music publishers after a specific length of time has passed. However, Duran Duran recently lost a similar case - when the British High Court ruled that the contracts they signed in the UK took precedence over their rights in the US. Under UK law, music publishing companies can control the copyright until 70 years after the artist's death. Sir Paul is worried that Sony/ATV Music Publishing will use Duran Duran's loss to challenge his attempts to obtain The Beatles' back catalogue. "Rather than provide clear assurances to Paul McCartney that defendants will not challenge his exercise of his termination rights, defendants are clearly reserving their rights pending the final outcome of the Duran Duran litigation," said the legal papers filed on his behalf. 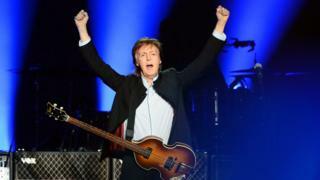 The papers state that Sir Paul wants "quiet, unclouded title to his rights". Sony/ATV said it was "disappointed" by the lawsuit, calling it "both unnecessary and premature". The first will be Love Me Do, which could revert to Sir Paul in 2018 - but others, including Come Together and Get Back, are not due to become available until 2025. His lawyers have repeatedly asked Sony/ATV to acknowledge his rights to terminate copyright - but the company has declined to do so, it continued. In a statement, the music publisher said it had "the highest respect for Sir Paul McCartney with whom we have enjoyed a long and mutually rewarding relationship with respect to the treasured Lennon and McCartney song catalogue". It added: "We have collaborated closely with both Sir Paul and the late John Lennon's Estate for decades to protect, preserve and promote the catalogue's long-term value." Lennon's share in The Beatles' songs will not return to his estate because Yoko Ono sold the rights to his music to Sony/ATV Music in 2009, with those rights lasting the entire copyright's lifetime (70 years).